It’s been observed by a fair amount of people (including crass-but-accurate critics like Doug Walker) that [some] current kids’ shows are actually better than old ones. I'm not talking about brain-cell-killing series like Spongebob, mind you: I'm talking abut shows that have only just shown up within the past five years or so. Many teenagers and adults might protest this, of course, on the grounds that modern, cheap, computer-controlled 2D animation is more crude than the realistic, hand-drawn panels of the past. And I perhaps agree about the visual differences… but when it comes to stimulating storylines and dimensional characters, the toons of today actually win out. Want a spoiler-free example? Well, look no further than Disney XD’s current saga of mystery and mayhem: Gravity Falls. While attending the California Institute of the Arts, a young man named Alex Hirsch decided to try and create a short film/teaser for a show that he had come up with, inspired by his own summer vacations with his twin sister. His school project caught the eye of Disney itself, and he was invited to pitch the concept to them. In 2012, Disney Channel bought the idea and started airing the show, filling it with cyphers and coded messages that hooked as many adults as it did kids. By just this past August, Gravity Falls was ranked as the best animated kids’ show of the year at the Annie Awards, and it's featured guest stars like Nathan Fillion and even Weird Al Yankovic! Basically, it came out of nowhere and doesn’t look like it’s leaving anytime soon. The show follows the summer exploits of twelve-year-old “Dipper” and Mabel Pines. They're a dynamic twin duo who have been dropped off to stay with their shady great uncle (“Grunkle”) Stan for the summer. Where are they staying? 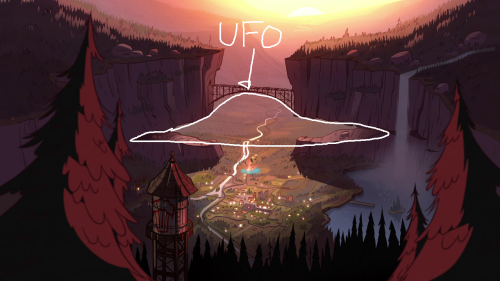 In a town called — you guessed it — Gravity Falls. …and cool teen Wendy hanging around. 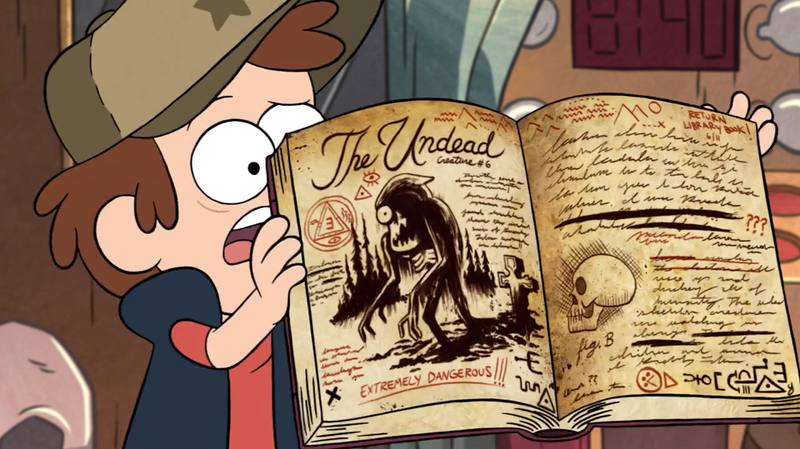 Not until, on their first full day in town, Dipper discovers a mysterious journal written by an Author with six fingers. He (or she) appears to have recorded strange, supernatural goings-on in the town: monsters, ancient curses, secret passages, and all kinds of bizarre occurrences are spelled out in detail. And before long, Dipper starts to realize that the mysterious Author was right. Soon the twins’ summer is filled with zombies, sea monsters, unicorns, and more teenage crushes than can be counted on one hand. Are there other journals? Who is this mysterious Author? Are there other people looking for him, too? Will Dipper ever get a date!? As mentioned before, the grungy caricature visuals of modern TV animation don’t appeal to a lot of art traditionalists — but viewers who can look past the over-simplified design of Gravity Falls will be glad that they stuck around. As many a nerd can probably tell you, one of the hooks that draws even adults to this show is its interactive mystery-solving puzzles scattered throughout every episode. Symbols, equations, coded messages, and more are slipped into the theme song, the backgrounds, and the credits. Some obsessive fans actually go through the show frame-by-frame and race to solve each new challenge before anyone else. What sort of information do they uncover, you may ask? Not blatant spoilers, necessarily, but enough to throw fuel on the flames of many, many conspiracy theories that viewers have. In fact, the mystery element is one of the key motivations to keep watching (as it is with any show). And Gravity Falls handles its stories with a delightful mix of suspense and tongue-in-cheek humor. Much in the same way that Cartoon Network’s Adventure Time turns fairy-tale cliches on their heads, Gravity Falls does the same with detective and ghost story archetypes. It handles plot twists with a self-aware, blunt manner that will tickle adults to no end, even if the kids aren’t quite aware enough to recognize the satire just yet. And furthermore, perhaps one of the other great elements that child-viewers will one day look back on and appreciate is its phenomenal female lead: Mabel Pines. In a television world of leather bikinis and high heels, Mabel is content to wear comfy sweaters (each with a logo for any occasion), rock her braces, dress up her pet pig, and take sass from no one about it. She may be as wild a fangirl as anyone else her age, but if her dreamiest crush bad-mouths something she holds dear, she’ll drop him like hot lead and tell it like it is. More preteen girls in the world need that kind of confidence. Mabel would attend a fancy ball, a mud-wrestling tournament, or a karaoke puppet show with equal charisma. She and her friends value each other for their personalities, and not for their appearances. She understands the value of staying positive, and sees the best in everyone …except all the evil villains who try to kidnap her and make her their bride (a la every Disney villain ever). It’s a great example of how her magnetic personality is more important than her looks (because it’s hard to tell exactly how attractive she is; we’re never told that she’s hideous, nor that she’s stunningly beautiful. She’s just Mabel). And Mabel’s heart-on-her-sleeve mentality is the perfect balance for her brother’s suspicion-filled, occasionally-insecure dilemmas. She’s able to level him out and teaches him to embrace his emotions, while he protects her from trusting some shady characters too quickly or getting carried away in the moment. And words can’t even describe the wonders that Mabel works on her grumpy, antisocial Grunkle Stan. Even when the rest of the world turns their backs on him, she sticks to his side like duct tape and won't rest until she turns his prickly heart as soft as kitten kisses. So if you were to ask me why I (and perhaps many other people?) 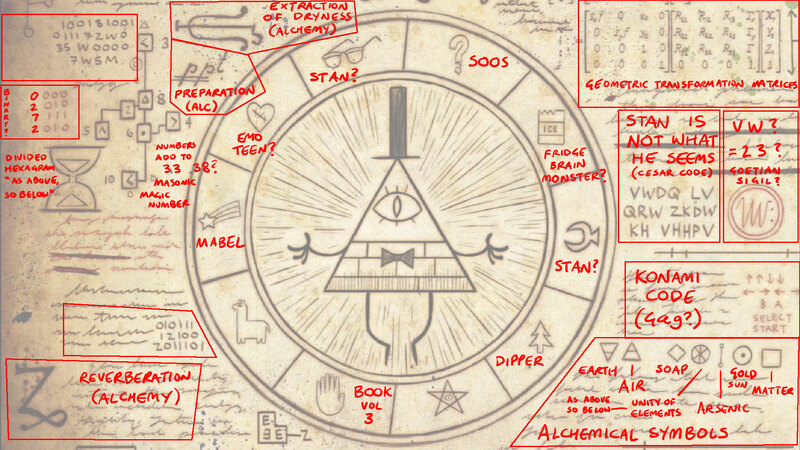 personally follow Gravity Falls, one half of it would be the Mystery. But another three halves of it would be Mabel. This show is roughly PG. It’s usually pretty clean, but there are a few moments of humor that might make adults cringe a little. Violence: There’s very little blood, but there are negative images now and again: teenage delinquency, ghosts with axes in their heads, and more. Though if I’d have to choose, I’d say the show is more on the icky side than the scary side. There are a lot of teen couples and crushes, but there’s not much shown beyond some hand-holding or dancing. This show is a mix of supernatural thrillers, interactive mysteries, hidden codes, and slapstick family comedy for kids roughly seven years old and up. It dabbles in preteen angst now and then, but does a decent job of putting value on family love and honesty above temporary infatuations. Bad decisions yield consequences, and good ones are rewarded; but differing personalities are also portrayed in a healthy light. No one person appears better than any of the others all the time, because they face a variety of situations and each has to be handled differently. That depends on you. I can understand if the animation is a turn-off for some people. My recommendation? Find a good episode with some quality Mabel-time. That may be a little tricky, since Mabel doesn't really hit her stride during the first few episodes, and this mystery show builds on itself so some episodes require background knowledge. But half the fun of the show is in the characters anyway (even if you don’t understand some of the throwbacks). But if you want to give it a go, then you’d better get started anywhere you can; the episode count is only growing. And if you’re still on the fence, just give it time. There are plenty of clips and commercials on Youtube that might interest you if you’re more of a visual person (like myself). But personally, my absolute favorite video is a fan-made trailer that treats the show like a movie, and boy is it ever fantastic! I had to watch it twice back to back when I first found it! Gravity Falls is the show that reminds us we’re all a little different, but that doesn’t mean we can’t band together and solve the mysteries that we face in life… be they the mysteries of puberty, or the mysteries of the supernatural.